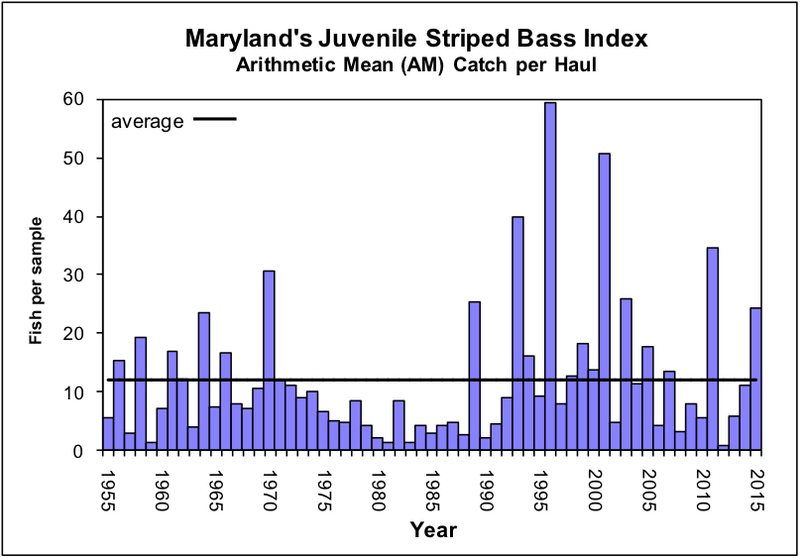 That’s not a cheer you’re likely to hear at any NFL game this fall, but after several years of disappointment, striped bass anglers are slapping fives all over the East Coast about the news that Maryland’s Young of the Year (YOY) index came in the eighth highest ever. I’m not surprised since I’ve seen thousands of fingerling-sized rockfish feeding in the shallows through the summer. Many of my fishing buddies have also noticed all the baby fish. About a month ago, I penned a Hooked Up forum post about all the tiny rockfish. 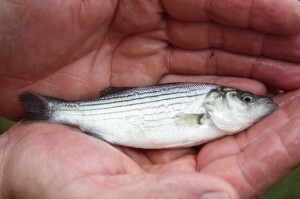 You can read my comments and those of other anglers here: Hooked Up – Zillions of Tiny Rockfish. Count me as one of those joining the celebration. Back in 2011 we also had a good spawn. If you’ve been fishing on the Bay recently, you know that it’s relatively easy to find schools of breaking rockfish in the 15-20 inch range. Many of these are 2011-class fish. Now that we’ve had another successful spawning year, we can hope for continued good striped bass fishing. By 2018, most of this year’s baby fish will be 18-inches or longer. At the same time, the 2011 fish will be approaching the 30-inch mark. Now that should be fun! If fisheries managers make the right choices, we should enjoy good striped bass fishing in the Chesapeake Bay for at least the next decade. Unfortunately, that’s a big if because, when it comes to managing fish, nothing is certain. Conflicts between user groups – each wanting a bigger share of the stock – can result in politically-driven decisions instead of ones based on sound science. I think it’s important that we don’t count our chickens (or in this case rockfish) before they hatch. Just three years ago, the rockfish spawn was the lowest ever recorded. Virginia’s tally for this year came in just about average. The fish still need time to recover. People seem to forget, amidst all the giddy reporting of this year’s success, that the Atlantic States Marine Fisheries Commission (ASMFC) forced Chesapeake Bay fisheries managers to make significant reductions in the harvest of rockfish last spring. Maryland, Virginia, and the Potomac River Commission fought it tooth and nail, but the reductions stuck. 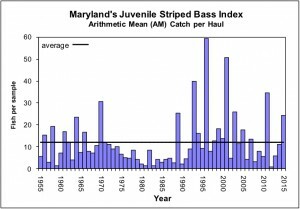 In his public statement about this year’s successful spawn, Maryland DNR’s new Secretary Mark Belton said, “This year’s survey demonstrates that striped bass are a very resilient species when given favorable environmental conditions for reproduction and survival.” That’s all well and good, and there’s no doubt that the weather created great conditions for spawning last spring, but the Secretary missed an opportunity to pat his agency on the back. During the 2015 catch-and-release season in the Chesapeake Bay, there was a no-take slot between 36- and 40-inches. Oh, the complaining was mighty among fishermen in the meat fleet about all the slot fish they had to release, but obviously, the reductions are working. 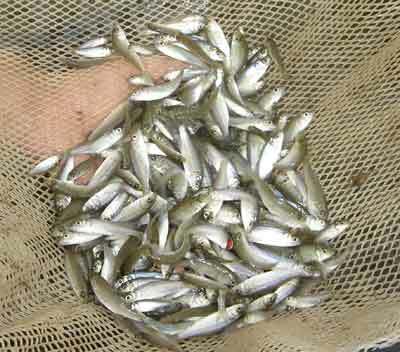 While no one can point to any one reason for a successful spawning year, it doesn’t take a genius to figure out that when there are more spawning-age fish in the water, they make more baby fish! Let’s take a few minutes to congratulate fisheries managers for, despite themselves, getting it right. A fisheries biologist who is well-placed within the ASMFC’s management sector once told me that when it comes to striped bass, little changes can make big differences in abundance. If we want to see more successful spawns in good-weather years like 2015, we simply must protect a healthy stock of spawning-age fish. That’s what we’re missing right now — the big fish. We all know that catching is good on the small ones, but fish above 28-inches long are hard to come by. The absence of bigger fish has been especially hard on anglers farther up the Atlantic seaboard where discussions are heating up about even deeper cuts to the harvests of the spawning stock. Our friends to the north won’t enjoy the strong 2011 class for a couple of more years, and it will be 2020 or later before this year’s fish migrate up the coast. If we want to see significant improvements in abundance in all regions, we must continue to release the big fish. Although it hasn’t started yet, I’m sure we will soon hear calls for relaxed restrictions on harvesting rockfish in the Chesapeake Bay. While this is expected from the commercial sector, don’t be surprised if you hear representatives from the recreational fleet shouting the loudest. 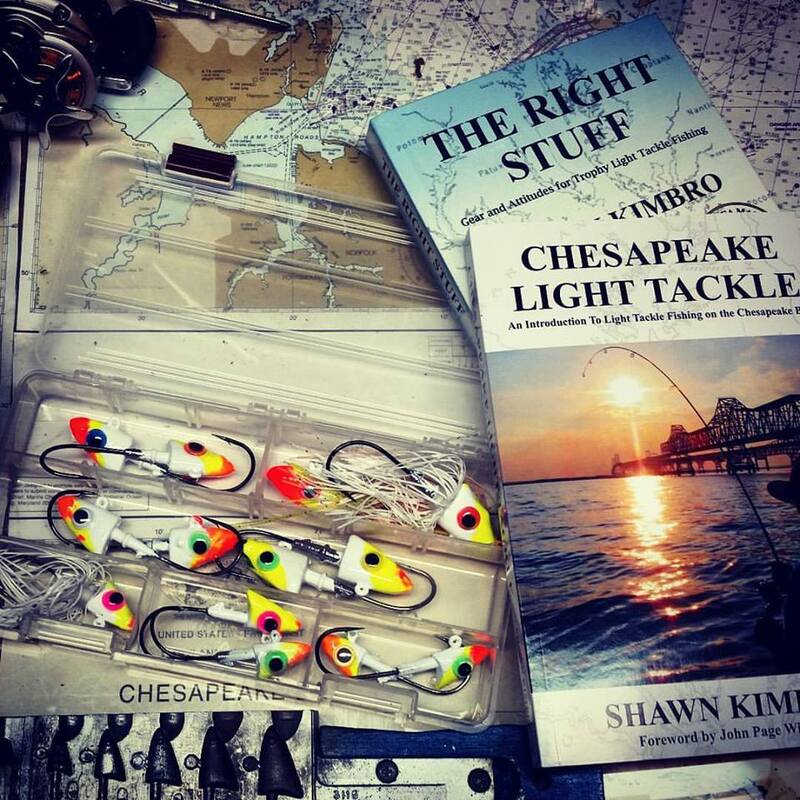 Many Chesapeake Bay anglers just don’t get the concept of fishing for the fun of fishing. They’re stuck on the belief that a successful fishing day means bringing home meat. There’s nothing wrong with keeping fish, but that doesn’t mean we can’t have a great day on the water while releasing the fish we catch. It’s way past time we started celebrating the experience of fishing. As I’ve said so many times before, a picture saves a thousand fish. One good example of the continued success we can achieve by releasing spawning class fish can be seen with red drum. 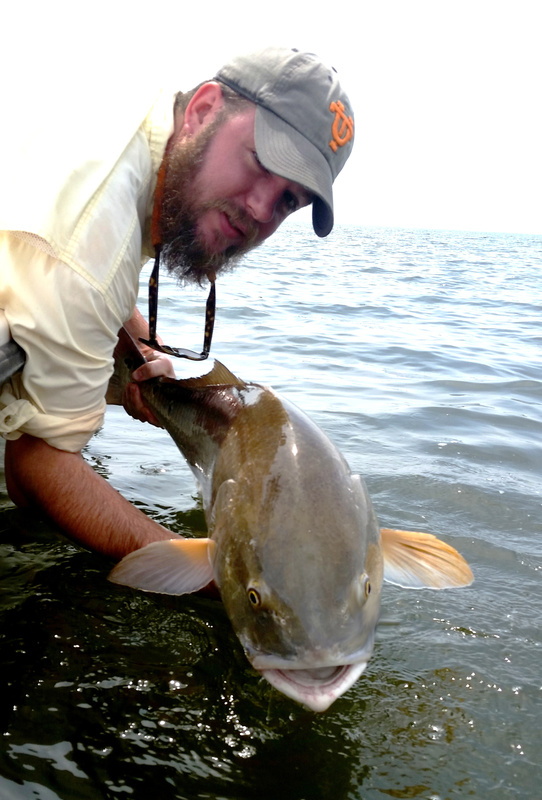 Chesapeake Bay anglers had a banner year in 2015 catching big redfish. Most were caught entirely by accident while targeting stripers. These trophies are here in the Bay because Atlantic Coast anglers have been required to release big redfish for more than a decade. We’re enjoying the benefits of strict conservation efforts initiated by states farther to our south. It’s great that we can still enjoy the amazing experience of catching these big reds, even though we have to let them go. The conservation ethic has improved up and down the coast so that now most anglers would release those big spawning-age redfish even if it wasn’t required. At the last Maryland Sports Fish Advisory Commission meeting, two commissioners urged DNR to allow keeping and killing bull reds in the Chesapeake Bay. To most of us, it’s unimaginable that people who are appointed to represent Maryland fishermen have such a careless attitude. The sad truth is that we recreational anglers can be our own worst enemies when it comes to conserving the fish we like to catch. I have my fingers crossed that voices of reason will prevail for both redfish and rockfish. I’m proud to congratulate those fisheries managers who insist on taking the difficult but necessary steps to conserve, and I’m happy to celebrate this year’s successful striped bass spawn. A new administration is in charge of our natural resources in Maryland, and the jury is still out on how they’ll come down on conservation issues. Let’s encourage them to maintain successful conservation efforts and implement additional measures to protect our spawning-age fish so we can see more successful YOY surveys in the Chesapeake Bay. I couldn’t agree more. It’s sad to hear about those guys wanting to kill bull reds. Too bad we don’t get to vote for who represents us on the advisory commissions. Excellent article Shawn. I agree with it all. Will try to remain optimistic managers will do the right thing, but we have experienced the opposite in the past. I am hedging my bets with also targeting sweetwater species to C & R.
Our teacher was just telling us about the rockfish last week and she said the same things you are saying about how we need to be careful since things are going the right way. I hope we can go fishing sometimes. I forgot to tell you that we have been seeing a lot of birds and small fish around our creek too. Good write up.Im seeing acres of the little guys up north too…top to bottom on the FF. If we keep protecting the big fish, when are we going to start protecting the fish they feed on?